What can I say about Guild Wars 2? One word, it’s epic! I have not played a massive multiplayer game for a long time (since the early days of World of Warcraft in fact) not necessarily because I haven’t wanted to (which is part of it) but because there simply hasn’t been any great MMO’s released that were worth the attention. The last MMO I played at any great length was World of Warcraft when it released, and I stuck around with that until the first expansion before I hit the level cap and got bored. 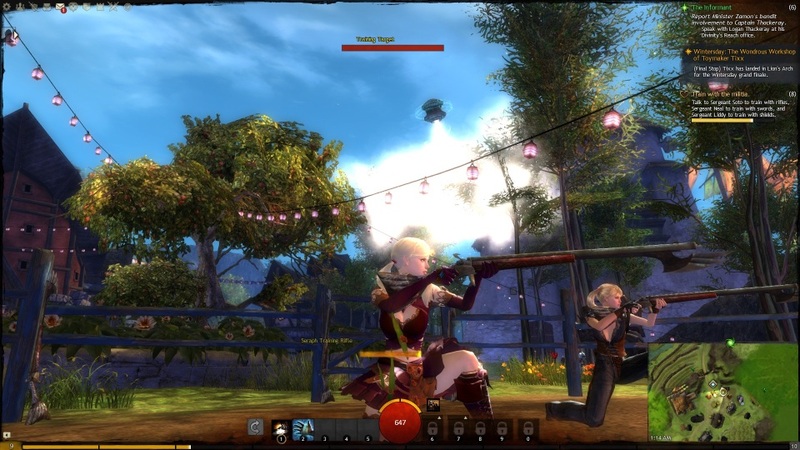 With Guild Wars 2, I’m only 10 levels in and so far has felt very fast and I’m having a lot of fun with it. Below I’ve included a few screenshots of my travels. The visual are amazing in this game, if you take away one thing about Guild Wars 2 it’s that is a beautiful game which very rich detailed textures and the character models are something else. When you first load up the game and go through the character creation screen even, you know you’ll be in for a real treat. The costumes on characters are absolutely amazing looking, so much detail has gone into making this game look the part and must of been a huge effort by ArenaNet. A job well done guys. The game play is very similar to World of Warcraft, but this game has learnt so much from its predecessors although some of the mechanics are similar, ArenaNet have done a great job in bringing fresh new ideas to the table. As a spellcaster (Elementalist) I would be used to watching my mana gauge refill and making sure to manage that correctly but here in GW2 that is gone. Instead, your spells simply have cool downs you observe before you can recast the spell but doesn’t feel ‘noobish’ at all which is a suprise. Big battles that take place in the world are great, reffered to as environmental events and are a great place to gain some experience with other players and fight a villain perhaps a few levels higher than yourself. These events are triggered randomly, but make the world feel much more alive and changing frequently which adds a whole new dynamic to MMORPG’s. Also, rather than having to walk great distances on foot/mount like other games, Guild Wars 2 makes it nice and easy to move between areas of great distance by the use of waypoints on the map screeen. It costs a small fee (a few bronze is nothing) to use them but totally worth it and removes the grind completely. One other improvement to the formula is that you no longer need to run back to a quest giver like traditional MMO’s but instead a message appears in your inbox where you can collect the reward from there (via the post!). Amazing. The soundtrack of a game can make it or break it and the score devised for Guild Wars 2 is epically crafted and adds to the environment a great deal. Set in the fantasy world of Tyria, the game follows the re-emergence of Destiny’s Edge, a disbanded guild dedicated to fighting the Elder Dragons, a Lovecraftian species that has seized control of Tyria in the time since the original Guild Wars. The game takes place in a persistent world with a story that progresses in instanced environments. 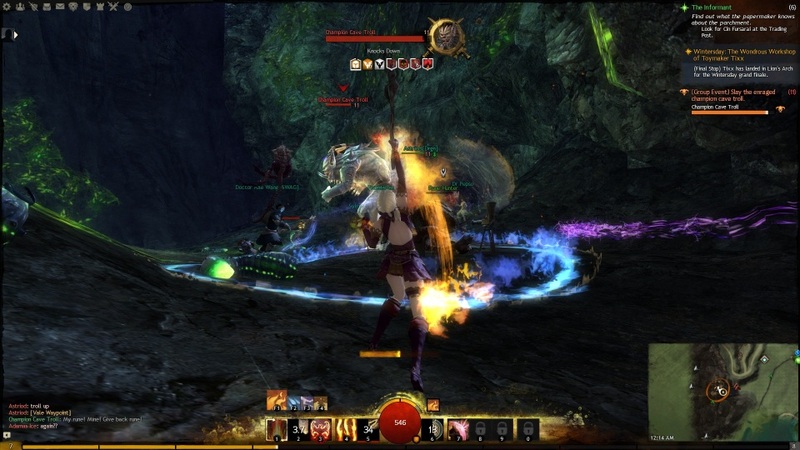 Guild Wars 2 is an amazing game, anyone wanting to sink quite a bit of time should not pass this up. If you want to have a life over your holiday break not spend on a computer, look elsewhere! ← Thanks for 2012 and Happy Holidays!